Home » Horizon 2020 » How you can exploit Horizon 2020 successfully as a complete beginner in 9 steps! The SARIMA conference gave me the opportunity to meet and make good contacts with extraordinary people high calibre in research achievements that try hard to extend their research outcomes and advance the innovation capacity of their organisations. I had evolved as a person by overcoming my fears on sharks, poisonous snakes (like black mamba), crocodiles and wild animals by snorkelling with sharks in the Indian ocean (see photo) and driving, walking and boating in the jungle of the Hluhluwe-Umfolozi Reserve National Park and the Isimangaliso Wetland Park (incl. St Lucia Lake). What an experience! Thank you SARIMA people, thank you Charmaine, for giving me the opportunity for experiencing all these. However, one of the most popular questions that I had to answer during the Horizon 2020 workshop and the SARIMA 2016 conference was how organisations that are complete beginners in Horizon 2020 but are fully eligible and with outstanding research and innovation records but with no experience at all in Horizon 2020 can exploit it with success. The answer for me was simple to give, since it is part of my recipe on Funding Expert Transformation Process (http://www.fundingexpert.academy/) but the demand for a practical answer from many researchers triggered me to give the following basic set of steps on how an organisation that is complete beginner in Horizon 2020 can exploit it successfully. Step 1: Identify your vision as an organisation. Where you want to be, what you want to do and what you want to achieve as organisation in some years from now. 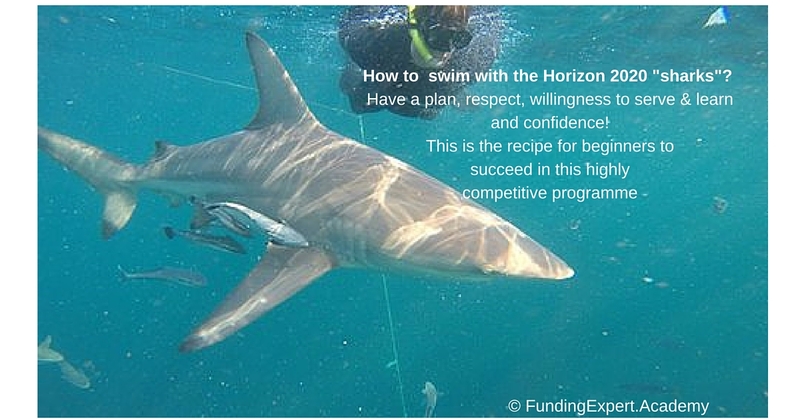 Step 2: Ensure that your vision is aligned with the three pillars of Horizon 2020, i.e. a) Creating forefront knowledge, b) Advancing growth and innovation and c) improving quality of life of people at EU and global level. Step 3: Discover what your organisation can offer that can make you distinct in your topics of interest! This is a very important step that you should seriously work on that. You should explore within your scientific, innovation and research achievements and records in your field. Position any research and scientific papers that you may have published, any innovations that can be highly exploitable in a global market, any patents of yours. Describe how your own scientific knowledge or innovations are or can become more advanced and get ahead of the competition. You need to try hard on that and you need to think as a marketer first and as a researcher second. Realise that Knowledge is not power any more but Marketing is. (I am a scientist and I don’t like this situation between knowledge and marketing but unfortunately this is the reality we have to face). Now next step is applicable especially for those organisations that in case they have tried really hard and they still haven’t managed to identify and present their distinct or unique selling propositions yet in their scientific topics. Develop and offer your services as Research and Innovation Manager in the Horizon 2020 proposal/project with tasks to prepare and monitor high quality plans such as the dissemination & Exploitation plan, the Communication Plan, the Innovation Management Plan, the Quality Assessment Plan and/or the Research Data Management Plan that are essential for a successful Horizon 2020 proposal. Step 5: Prepare your “sales” email” by giving emphasis on what you can offer to Horizon 2020 actors and proposal initiators and highlight distinct points as outlined above by giving emphasis on what you can offer and why someone should consider you in case they prepare a proposal in Horizon 2020. Remember that the key element in that email is that you don’t ask to participate in an Horizon 2020 proposal but you stress out the points that you can offer for a successful Horizon 2020 proposal and project. Step 6: Identify potential Horizon 2020 proposal initiators in the area of your interest. There are some search facilities for partners for Horizon 2020 proposals (e.g. Ideal-IST) as well as social media but personally I am not fond of them and I prefer a couple of easy ways to do so, i.e. Identify already successful Horizon 2020 players mainly coordinators but also key partners in currently successful Horizon 2020 projects. You go to cordis database (link), click at the advanced search facility, and search Horizon 2020 projects related to your field of interest by inserting at the topic field related keywords (e.g. nanotechnology, or robotics, etc). Copy the contact details (name, organisation, phone number) of the coordinator and of any key partners that are known to be quite active in the field of your interest. Either use the online web form or search in google or at linkedin for their email address/profile for sending to each of them your “sales” email. Step 8: Don’t forget to follow-up every few months after your last contact. Send them an email every few months just to remind them your interest in collaborating with them and ask them whether they will be in an event (conference, infoday, brokerage event, etc) that you may be attending or to highlight them an article that you have just published in the common area of interest. Just find some good reasons for keeping in contact with them. You may wish to follow-up also with a phone call. Step 9: Stay organised. Keep a record of your actions and any feedback received and status in a spreadsheet or in a simple CRM (Customer Relation Management). I use Capsule-CRM that is well integrated with gmail but you can just use a google spreadsheet, especially in cases that there is a team and not only you that you do the follow-up. I can assure you that this formula works very effectively but you need to be consistent, a little bit patient and don’t skip any steps at all. Remember also that most of the success in Horizon 2020 is based on fruitful connections and relationships are like muscles, the more you work on them, the more powerful they become. Please comment below, on your experiences in approaching and connecting with key actors in Horizon 2020. In case you want to develop further what you have discovered in this article and exploit fully and become a pro in Horizon 2020 or in european funding, you are strongly suggested to join any of my Funding Expert Academy programmes. Nikolaos Floratos. thank you for this interested Article, every day you add some thing new. I saw that the first step to win R&I grants is selecting at least one Partner, who has a capability to write and win proposals. and still we learn from the previous rejected proposals!